I’m not sure how this band got their name — perhaps it’s a joke, since there are so many death metal bands in their part of the world (Norway) with similar names. Maybe the name gets them booked for shows with Grimfist, Hades Almighty, Twin Obscenity, and the like. 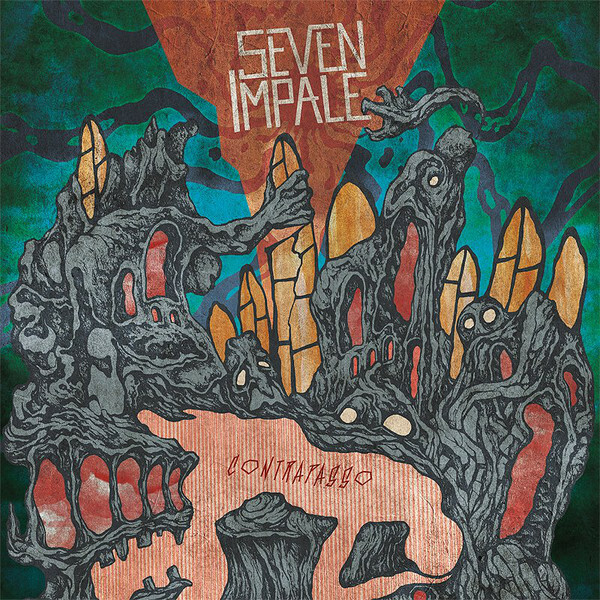 Once there, it would be readily apparent to concert-goers that Seven Impale are an entirely different species of beast, but hopefully the quality of their performance would avert a violent reaction in the crowd. Or maybe I’m way off base. Seven Impale is, in fact, a talented jazz-rock band with a wide range of influences. At times, the combination of keyboard and saxophone, along with the complex arrangements and sense of humor, have a bit of RIO or Canterbury flavor, though the inclusion of a dose of heavy classic rock dispels that on short notice. The rock element brings a resemblance to Motorpsycho, but Seven Impale tends to stray further from song forms than Motorpsycho. Other comparisons that occur at various places during these nine tracks include Qoph, Anekdoten, Panzerpappa, and some prog metal band I can’t place. But the combination of all these divergent styles is really striking, and makes for a smile-inducing listen. They’re always coming up with something new and unexpected, and they’ve got the smarts and chops to pull it off. It’s impossible to single anyone out — it’s the aggregate impact of all the players together that makes Contrapasso so successful. This is one case where a chugging metal guitar doesn’t turn me off, both because the notes and rhythms are relatively cliché-free and because it’s used to back leaping melodies on keys or sax. Expect the unexpected, prepare to be surprised, and just sit back and enjoy.